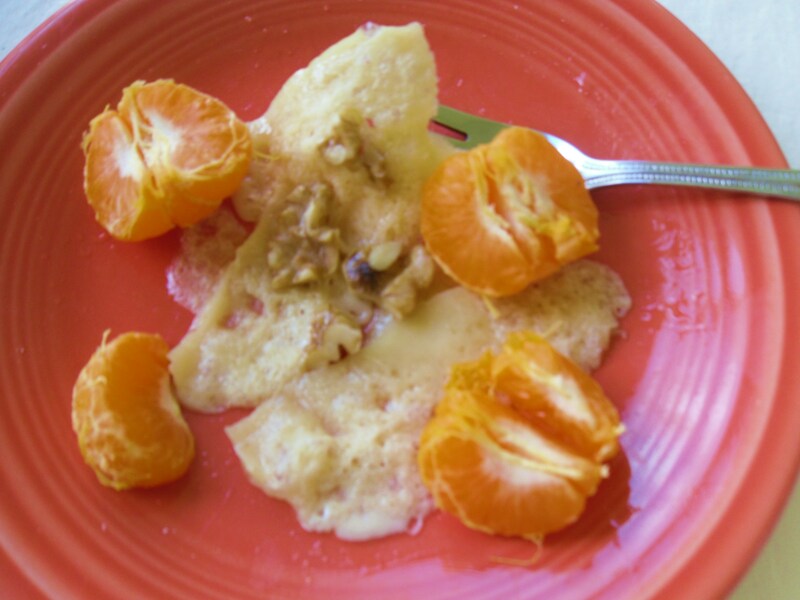 Simple 3 Ingredient Delightful Bite: Parm Cheese (heated until pliable), walnuts and juicy clementines. 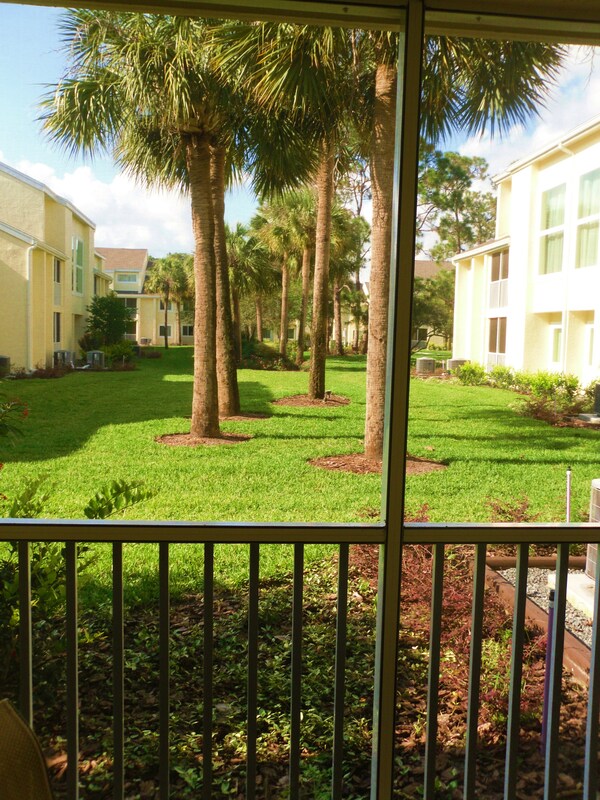 View from the condo porch. It is 75 degrees, which is why I need to be outside more than I want to be in the kitchen this week. Needless to say, I’m totally in my Vacation Mind. So far today I’ve “cooked” a couple of bowls of cereal, a PBJ sandwich and peeled some string cheese and clementines. Not fancy fare worthy of food posting, really. But then, at Happy Hour time, I got inspired. 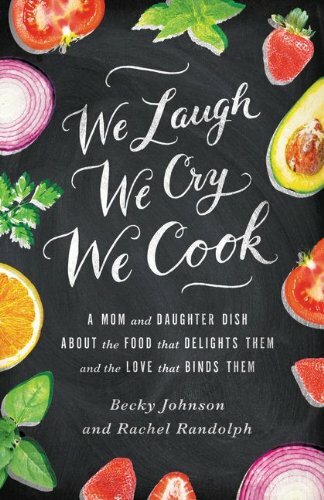 I saw some Parmesan cheese and walnuts (I’d packed them in my carry-on from home), and a bowl of fresh Florida clementines (bought in haste from the local grocery last night.) Let me tell you, these Floridians really get premium citrus. These clementines are so juicy they nearly burst in your hands as you peel them. Naturally sweet and tangy. Oh my. When fruit is this good, you don’t want to do much to it. Just let Nature shine. 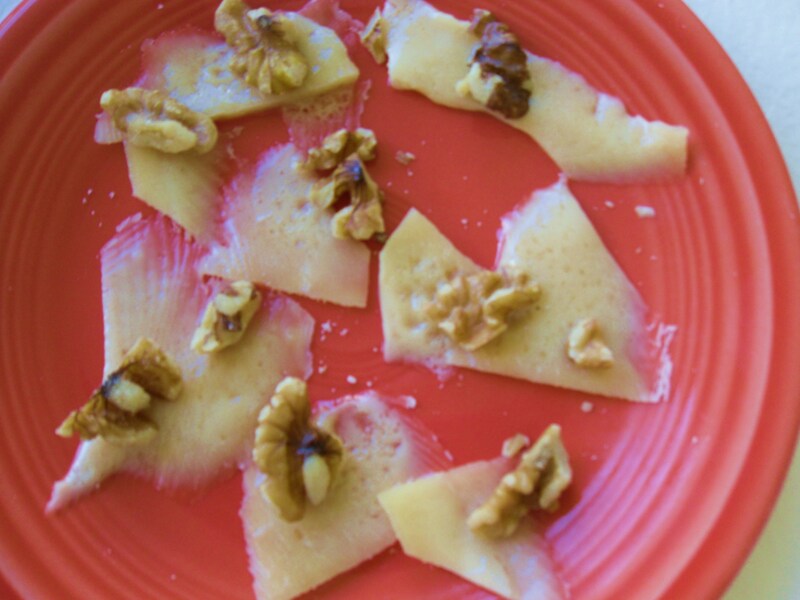 So, on the fly I invented these Parm Cheese-Walnut and Clementine Appetizers. Salty, nutty, warm meets fresh, tangy, sweet and cold. So yummy. Our cocktails in hand (see my recipe for Clementine Mojitos), I sliced a few “Parm shards,” sprinkled a few walnuts on top. Microwaved for 15 seconds. 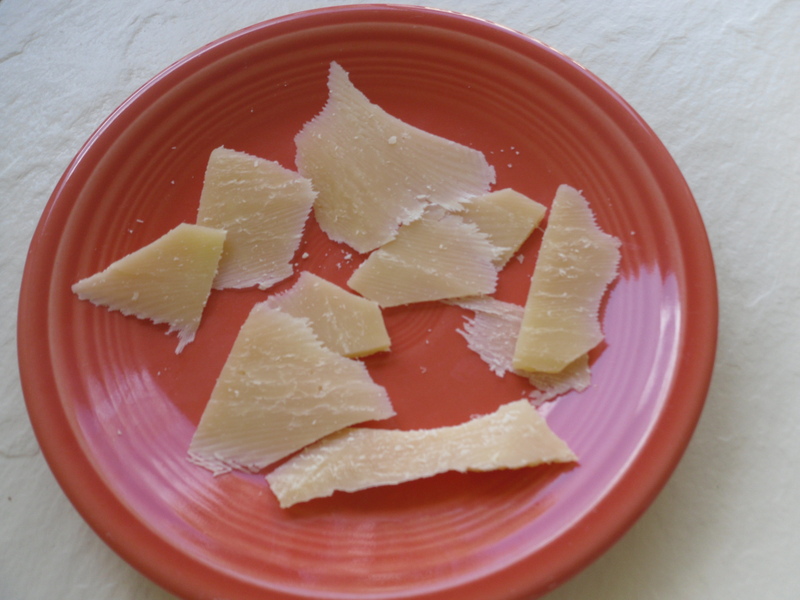 The Parmesan became just “melty” enough to be pliable. 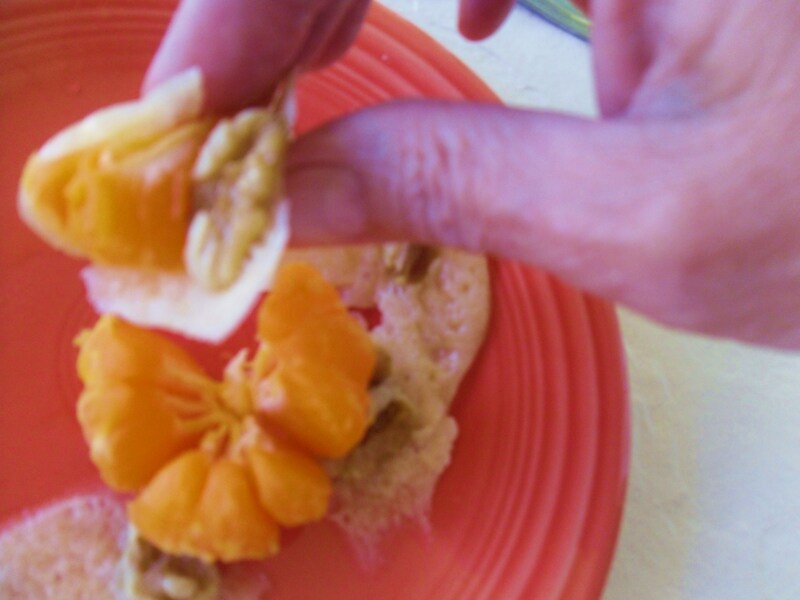 I rolled a piece of the warm Parm around a walnut and a slice or two of fresh clementine. It was Happy Hour in our mouths in less than a minute. That’s it. That’s the whole 3 ingredient, 15 second recipe. The pictures below will show exactly how to throw this instant party food together. 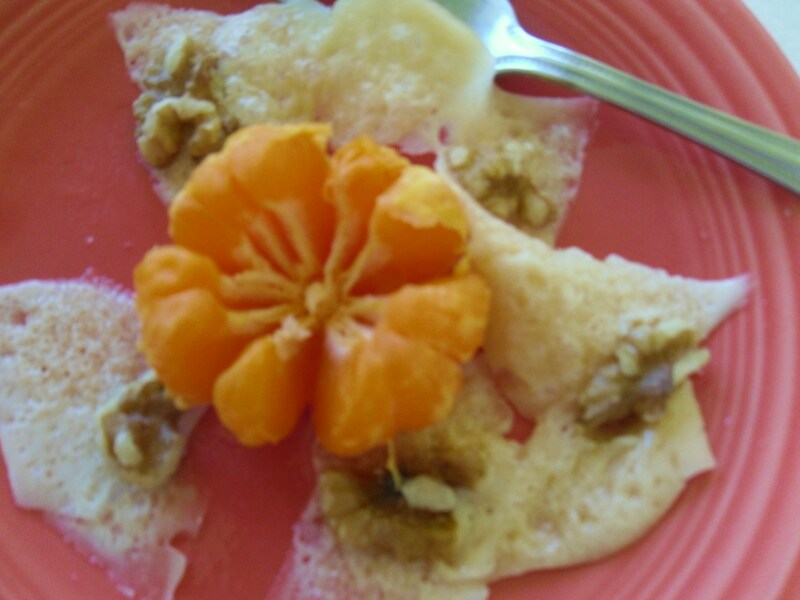 Variations: Try with other cheeses, nuts and fresh fruits in season. For a larger crowd, use a baking sheet and put in a 250 degree oven for about 5 minutes or until cheese is just warm and pliable. As parm cools, you can lift up little pieces and wrap around fresh clementine pieces, pop in your mouth and be very happy. Sometimes the best things in life really are the simplest! I’m thinking apples would be delicious with this too! It would…. and a hard, sharp cheddar cheese would be yummy! Or pears! Oh, YUM! This sounds sooooo good and you have to love a girl who can hear the romantic roll of thunder in the flushing of a toilet.